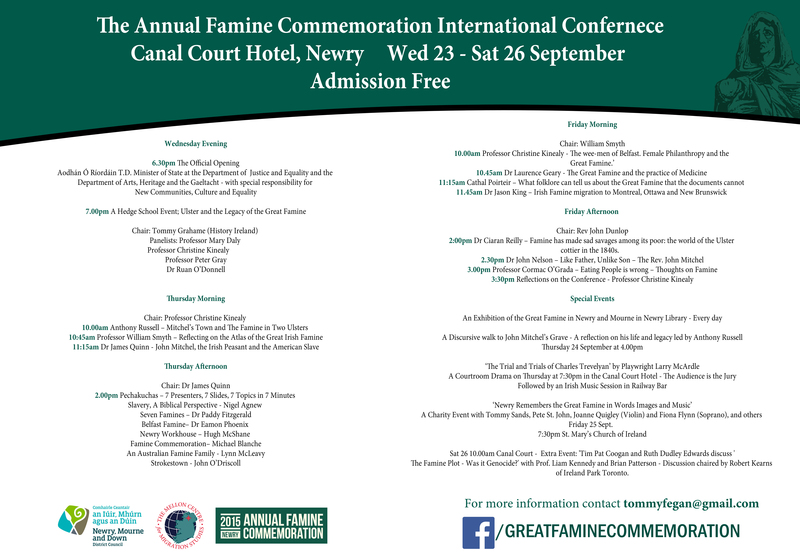 2015 Annual Famine Commemoration Newry International Conference, September 23-26, 2015. 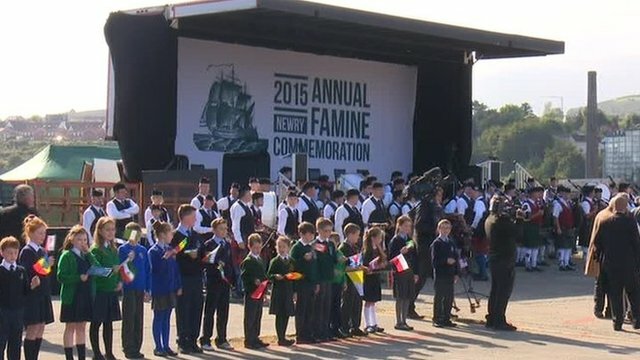 On Saturday 26 September the National Famine Commemoration took place in Newry, County Down. As part of the Famine Commemoration, an international conference on the the theme of “John Mitchel: The Legacy of the Great Irish Famine” was organized by Anthony Russell, Tommy Fegan, and Paddy Fitzgerald. This is the first time the event will be held in Northern Ireland and follows on from a successful hosting in Strokestown, county Roscommon in May 2014. 2:00pm Dr Ciarán Reilly – ‘Famine has made sad savages among its poor’: the world of the Ulster cottier in the 1840s. 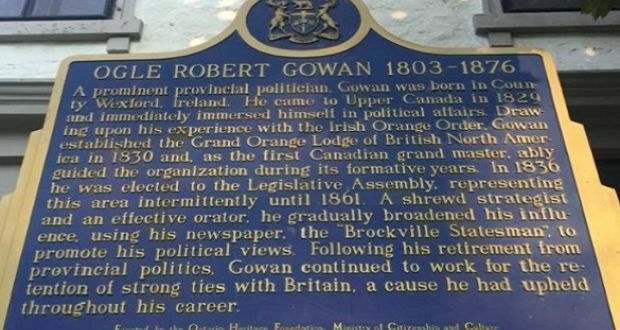 10am ‘The Famine Plot – A discussion on the Great Famine and Culpability’ Chair: Robert Kearns – Ireland Park Toronto; Panellists: Tim Pat Coogan, Ruth Dudley Edwards, Professor Liam Kennedy, Brian Patterson. Canada’s Ambassador to Ireland, Kevin Vickers, delivered an address about the Canadian Famine Irish at the opening ceremony of Miramichi Canada’s Irish Festival on July 17th, 2015.
landed on this island, where temporary fever sheds had been erected for their reception… The number of deaths, as far as we have been able to ascertain since she put into this port, up to yesterday evening, was forty – a shocking mortality – and several bodies were interred on Saturday, Sunday, and yesterday evening on the Island… The disease is typhus fever. He fell, a sacrifice to that alarming disease with which the passengers of the ill-fated ship Looshtauk were visited, and expired on Friday morning last, about 3 o’clock. His remains were placed in a double coffin, made perfectly air tight, and conveyed from Middle Island to Coulson’s slip, and from thence to St. Paul’s Churchyard, followed by an immense concourse of people. We have seldom witnessed an occurrence that cast so deep a gloom over the community. As soon as his death was announced, all the shops were closed and business partially suspended throughout the day. 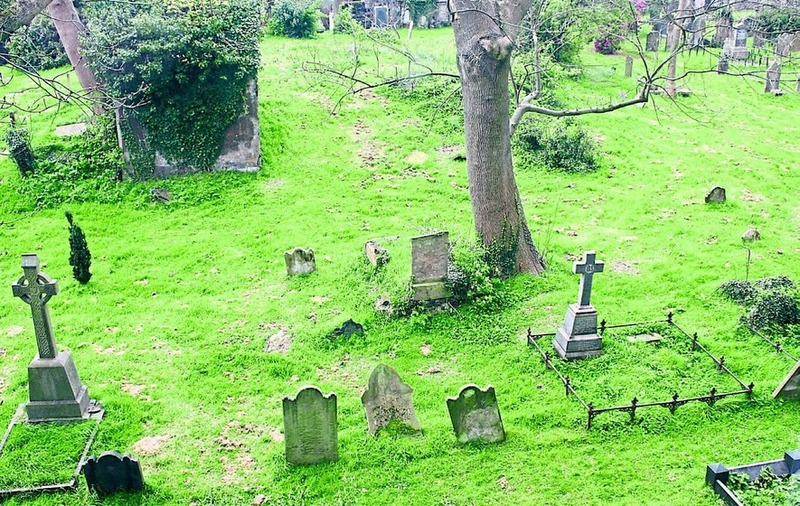 The sum of £60 was subscribed in the churchyard, for the purpose of erecting a suitable testimonial to commemorate the sad event, and testify the respect felt for the memory of the deceased. It was on this island that Dr. John Vondy gave his life caring for the Famine Irish. He was no ordinary man. Let us acknowledge that while he tended to the sick, Dr. Vondy was not well supported, and toiled almost by himself without adequate facilities, shelter, or even food to alleviate their suffering. Still, he did all that was within his power to care for the sick. Imagine the fear that he must have felt when he too fell ill, until his sister came to nurse him in his final days and hours. 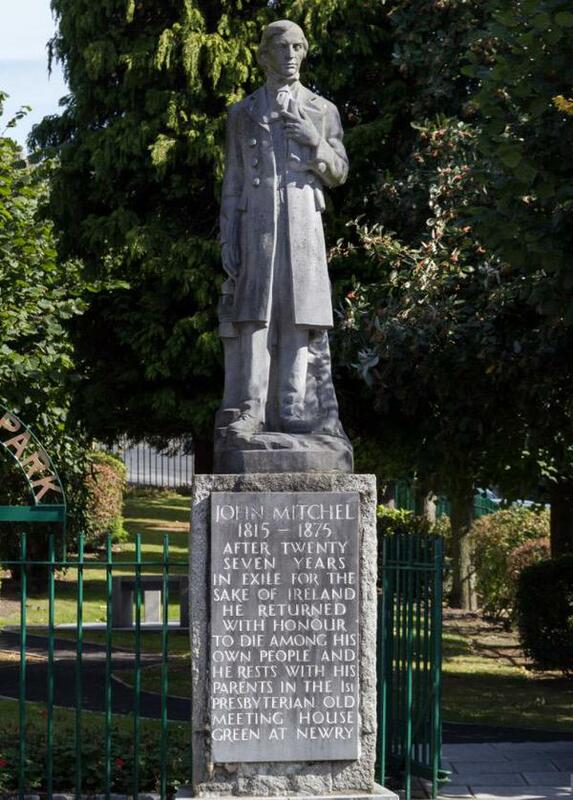 Like Bishop Michael Power in Toronto, and the Grey Nuns of Montreal, Dr. John Vondy exhibited selfless devotion in tending to the typhus-stricken Irish emigrants right here in 1847. This island is a special place. It has witnessed some of the darkest moments in our history, when we recall all of those Irish emigrants who perished here, or beforehand at sea. But it has also witnessed some of the finest moments in our history, when we recall the heroic deeds of Dr. John Vondy. 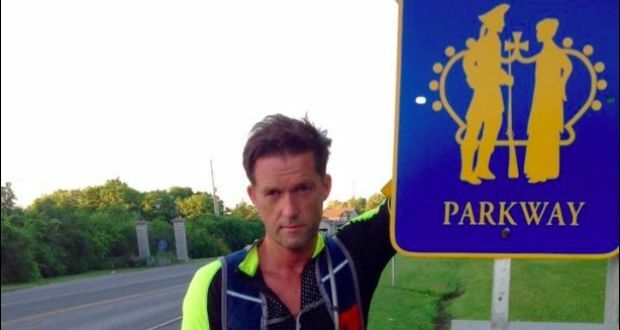 His story, like that of Bishop Michael Power and the Grey Nuns, is one of laying down his life to protect the most vulnerable. It is a story that belongs to the most cherished part of our history. It is a story of Ireland and a story of Canada, of Middle Island and the Miramichi, which binds our peoples together. 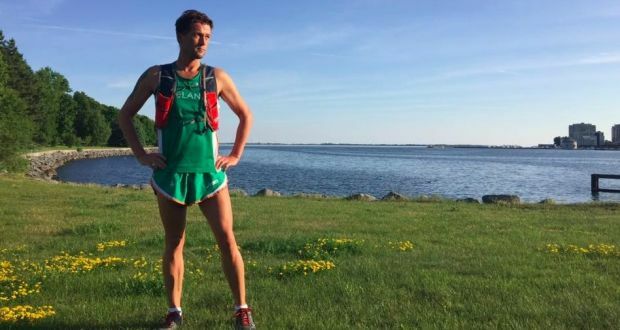 It is also a story that attests to the bonds that were formed on this island, between the most vulnerable Irish who came to New Brunswick, and the people of Miramichi who cared for them. Today we are increasingly confronted with images of desperate people crossing seas in ramshackle ships that resemble the Loosthauk. We can only hope that they will encounter caregivers like Dr. John Vondy when they come ashore. In an age of increasingly desperate acts of migration, his compassion provides a lesson for us all. From right to left: Canadian Ambassador to Ireland, Kevin Vickers; Director of Ireland’s Great Hunger Institute, Professor Christine Kinealy; Curator of Digital Irish Famine Archive (NUIG), Dr. Jason King. It gives me great pleasure to launch the Digital Irish Famine Archive and “Saving the Famine Irish: The Grey Nuns and the Great Hunger” exhibit. 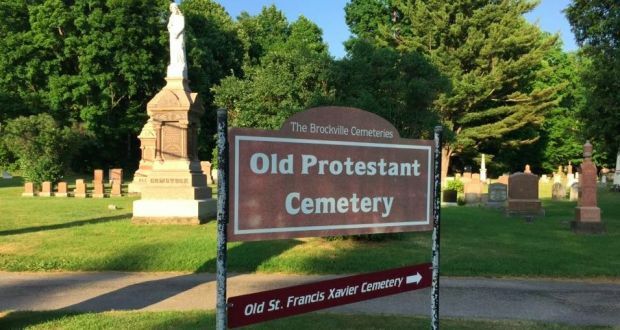 Both the digital archive and the exhibit commemorate and pay tribute to the Grey Nuns of Montreal and people of French and English Canada, like Bishop Michael Power in Toronto and Dr. John Vondy in Chatham, now Miramichi, New Brunswick, who gave their lives caring for Irish emigrants during the Famine exodus of 1847. 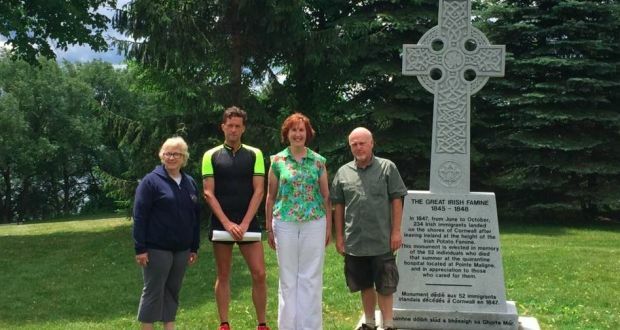 It is especially fitting that we launch the digital archive on this day, after Montreal’s Irish community has just made its annual pilgrimage to the Black Stone monument, which marks the site of the city’s fever sheds and mass graves for six thousand Irish dead, and before the Irish Famine Summer School begins at the Irish National Famine Museum in Strokestown, County Roscommon. 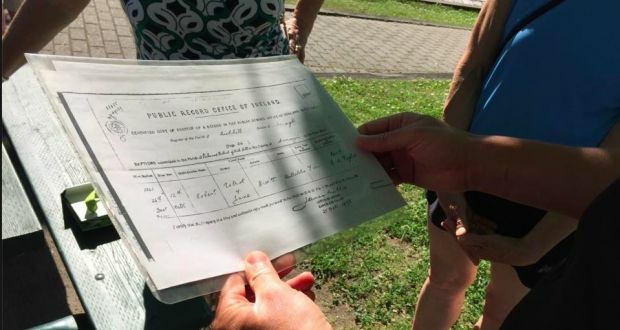 The stories contained within the digital archive attest to the selfless devotion of the Grey Nuns in tending to typhus-stricken emigrants and providing homes for Irish orphans. In an age of increasingly desperate acts of migration, their compassion provides a lesson for us all. 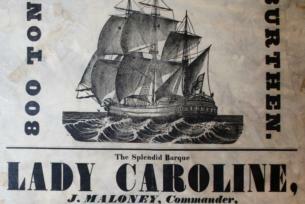 The Digital Irish Famine Archive can be found at (http://faminearchive.nuigalway.ie/).